Download iStonsoft Android SMS+Contacts Recovery with the registration code (no crack) and restore lost or deleted SMS and contacts from an Android device with ease. For the next a few days, you can get iStonsoft Android SMS+Contacts Recovery for free through a limited time giveaway. Respected readers, iStonsoft Android SMS+Contacts Recovery is a very useful and easy to use piece of software with truly user friendly interface that is designed for those who own an Android Tablet or/and Smart phone. As iStonsoft Android SMS+Contacts Recovery’s name suggests what It is designed for? Yes, You’re right, This useful piece of software is a kind of data recovery software to recover lost or deleted SMS messages and contacts. No matter you are a beginner or a veteran PC and Android user, you can easily restore deleted, lost or formatted text messages and contacts from Android Tablet and Android smart phones. 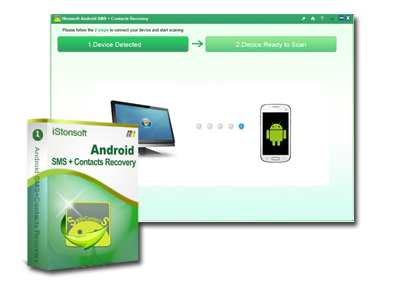 iStonsoft Android SMS+Contacts Recovery is designed for Windows 10/8/7/Vista/XP and Mac OS X 10.7 – 10.10 and supports nearly all Android powered devices and phones including Samsung Galaxy/Note, HTC One, LG Optimus and many others. iStonsoft Android SMS+Contacts Recovery is normally available priced 40$, But for the next few days, every interested Windows user can get a registration code to activate iStonsoft Android SMS+Contacts Recovery full version for free. All you need to do is Download iStonsoft Android SMS+Contacts Recovery from here. Now use following registration code to activate iStonsoft Android SMS+Contacts Recovery full version for free. If you have missed this giveaway, You can still use its free trial that can be downloaded from here.